True strength comes from pushing yourself passed your limits, if you never experience weakness how can you push beyond it,so when you are faced with loss you have a choice, either pick yourself up dust yourself off and continue on, or give up, this is a true test of strength. Passion is needed to be truly determined, as you need a reason to to push on to be able to say, 'I will not go quietly into the night, I will not go without a fight, I am going to live on, I am going to survive" it is what inspires people, it is that fire inside you that burns bright. Fear helps us survive, it warns us to dangers, it helps us to instinctively save ourselves and others, one should be aware of their fear, understand their fear, but not live in fear, Courage is pushing through this, despite your own fear. If a person always compares themselves to others and what they can do, then this person will always come up short to someone, this is why it is best to compete with yourself, to push your limits beyond what you can currently do, this is the road to perfection, you cannot see over the horizon, and there is no end, although it is worth it as every step you take brings you closer. Have you ever come across a situation where your friend "jio" you to play partner stunt, but the flyer is someone not so experienced and you have difficulty in stunting, hence you decide not to go? Because you thought you go also no use because you will end up not being able to stunt much and become the spotter most of the time. But then later your friend got another flyer that is someone small and experienced and ask you to go again. This time you feel that you can stunt and learn alot from her, therefore you decide to go. It is just like a friend "jio" you to go out from NTU to Taman Jurong to eat, but ask you to cycle there, you decide not to go. Then later he says he got a "small and experienced flyer", a car to drive you there, you decide to go. Does it matters so much to train with less experienced flyer? Must one always have the luxury of training with a experienced flyer? Is it no car means cannot go out? No car means no value? Got car then can go out? Got car then people will follow you? I guess it really is the case these days, you have nothing they need, they kick you away. This is life. But I would like to urge all not to think like above. For me I think that we all have to train with various different flyers of all levels of experience. This is the only way that one can improve, this is the only way you can feel your mistakes. Do not always think that you can deserve the luxury of training with experienced flyers. If you only train with experienced flyer, no one will like it and they will not ask you again in future. Hmmm... What is me with cars and public transport today? Keep giving analogy with them. I guess it must be the 1 and 1/2 hour of journey that inspired me with these analogy. I got to realised and achieve "enlightenment" to things which has always blurred my judgement. P.S: Sorry I am not able to upload or send the pictures and videos today as I am very tired from the long journey, thanks to myself for being "sua ku". Need to rest early. Till some other time ba. Another experience of spotting I would like to share with everyone. It was suppose to be a routine catch from the spotter of a stunt they did many times before, but the spotter missed. Although the spotter was being so nice and is the only person who comes along to spot, I would still have to say it is his responsibility and fault, he was the last line of defence. A similar analogy will be when you kindly drove your friends out for supper, and you park your car without putting coupon. Your friend did mention to you that the ticket officer come here to check often, but you did not hear properly hence you did not put the coupon. Afterwards, you came back and you were summoned 30 SGD for failing to put coupon. So whose responsibility and fault was it? Yeah you are right, it was the "spotter's". Although you were being very nice to your friends by fetching them around all the time, end of the day, it is still your resonsibility to "catch the flyer", to put the coupon. Even if "it was your friend who dropped the flyer"; it was your friend who did not remind you clearly enough that the checks are very often, but it is still your wrong and your irresponsibility to "not make that routine catch", to not put the coupon. So morale of the story is if you are spotting, spot well. It is the spotters responsibility to put in his best to spotting. And also bases please be grateful or at least appreciative to your spotters who come along to help you even if the flyer did not fall, cause all it takes is 1 fall. If I was the spotter in the above senario, and I found out that the bases was ungrateful, unappreciative and worse of all speaking behind my back, I will never spot for him again. Bases you would not want that situation to happen right? When it comes to spotting, I have witness many different kind of spotters and many different senario, just like to share my thoughts so that others may learn from my experiences. When it comes to spotting, is it always the more people the merrier? I would not think so. Too many spotters may get in the way of each other and in the end no one catches the flyer or something even worse. Lets say we are all training for Japan competition and it is now break time. You wanted to play some partner stunts. Its like say you just learn the cupie for 1 week and you are not that stable yet and therefore you ask for more spotters. Ok, the 1st person comes along and spots your back, then another 3 people came and volunteered to spot, so now there is 1 standing at the back, 1 front, 1 left and 1 right, a total of 4 people, getting all angles covered and each knowing where to catch when the flyer falls. But you are kiasu and decide to over kill in case you thought 1 might "miss" so you called up another guy from all the way across the mats, cos he is the so called "spider sense" in the team, to come and help you spot too. The 5th guy don't know where to spot as all the places are already taken up, so he stands at the back, beside the 1st guy that came. You proceed to do your cupie and it was not stable hence the flyer fell back. The 1st guy would have got it covered, but the 5th guy being the "spider sense" guy dashes in and knocks the 1st guy out catching the flyer, while the 1st guy was knocked off and sprain his foot in the process. The first guy was injured and had to stay out of the coming Japan competition, and he happened to be 1 of the guy doing round-off back tuck in a team so lacking of people who could do gymnastics. No amount of apology is going to be of use, as he misses the Japan trip, 1 of the most important competition to him, and no one else, other than those already doing, can do the round-off back tuck. Saying sorry is NO use, the damage is done. Therefore morale of the story is do not get so many people if 4 is enough for that particular stunt. Its not always the more the merrier or the safer. You might 弄巧反拙, i.e getting the 1st guy hurt, and sometimes the damage is so big that it might even affect your competition chances, and the damage is irreparable. P.S: Being the 1st person means nothing these days. Its now 2315 hrs, some thoughts that I had in my 1 and 1/2 hour trip home from PPCC. It must have been quite a long time since I last took a public transport that last over an hour. I have always been going around places in the comfort and luxury of my small but sufficient car. And it was the first time I took the north east line by myself, ok at least got Ken to accompany me for a while and then for the rest of the journey the music from my always reliable Sony Ericsson K750i. I have to say that I was really an IDIOT... First I did not know when to alight to change to the east west line. I know at the back of my head it was Outrum Park, but I was just seating and waiting till I missed the stop. I had to get down at Harbour Front and take the train back to Outrum Park or so I thought. Therefore I got down and proceded across the platform and waited for the train to come. I waited for about 15 mins and yet I did not sense anything wrong, till a cleaner aunt came over to me and told me that the train only comes on the other platform, as Harbour Front was the end of the line. I was like WTF, I wasted my time waiting for a train that will not come. I did not even have to get down from the original train in the first place. At least 4 trains have zoom pass my back without me knowing. I am really "Sua Ku", if people saw me waiting, they must be laughing their heads off. But at least I was touched by the cleaner aunt's help, there is still some helpful people out there. I guess I should learn to take the public transport more often, there are so many things which you can see and observe which you cannot have if you were driving. You get to see the ugly and selfish sight of people. People rushing and pushing into the train just to get a seat. I am not a saint myself, I would have rush in too, if I was in the mood and not so tired. I myself should be more considerate; I am so sweaty and smelly that I should have just paid the measly 15 SGD, afterall I am working, to take a cab home myself and stink only 1 person instead of the whole train. Stunting is pretty much the same as the above senario, If you always have the luxury to stunt with a flyer that is good and light, your stunts always goes up, but you will not get to feel and learn the hard way. Its just like driving around in a car, you never get to see the outside world, the hardship that others face everyday. Taking the public transport more often helps you see and get out of your "well". One should occasionally stunt with a inexperienced, heavier flyer, the stunt may not go up, but so that he knows that there is still a world out there, that he must still improve the hard way. "Don't drive all the time, take the public transport, at least then you get to see the ugly and selfish sight of people, and also the nice and helpful side of some. Take the public transport more often so you will not be as "Sua Ku" and naive as me" = Don't always live in luxury and stunt with the good and experienced flyer, try to go the long way to boarden your horizon and improve your skills by stunting with the more inexperienced flyer. Can you trust its longing and take control? Been going to gym a little more regularly the past 2 weeks. I thought I would have improved on my strength, from doing all the partner stunts recently, but I was totally wrong. What I am carrying are "light" weight. I cannot even complete a set of 8 of 40kg bench press, whereas the other guys in my team are benching a minimum of up to 80kg with more ease than me. I could not even do 40kg squats without feeling my back going to break, whereas the others are doing 100kg and above. My dead weight lifts are only at 50kg, for a sets of 10, whereas the others are lifting close to 100kg. It can be a little sad to go gym with these guys, it makes you feel so bloodly weak, they can thrash me without even breaking a sweat. I guess I have to be more positive instead. Ok some positives... This would mean that while others are using strength, I am using technique to compensate for my lack of strength when doing stunts. And out of those who can lift such heavy weights, only one of them can do a cupie. And the one that can do a cupie is of a heavier weight category than me(by at least 10kg). Also I maintained a reasonable mass to strength ratio, which means I am still able to do a standing back tuck and at the same time I am also able to do a toss cupie. Non of the "heavy lifers" can do unassisted handstands or handstand walks, showing that they have yet to harness 100% of their strength and distribute it to the whole body. To everyone out there, this shows that technique itself can indeed take you very far. Ok now that my technique has taken me thus far, and I realised that I am very weak, it is time I hit the gym more often and build up those muscles and strength to compliment with my technique. This is the only way to go from doing full up hands to full up to extensions, from doing press up liberties to doing full around liberties, and then to doing liberty tick tocks and cupie pop overs, and from doing toss cupies to doing rewind cupies. Just to add on to the earlier blog; "stay hungry, stay foolish." A quote from Steve Job - CEO of Apple. No matter how foolish it is, do not give up your passion! This performance was something special for me. It was my last public performance for NTU ACES. Having been involved in over 50 performances in my past 3 to 4 years, I still felt stress with this last one. This performance had to be one of the most pressurizing I have done. It was the first time I was going to attempt a cupie in a performance routine. I wanted to go out with a bang. But sadly, I did not manage to do my cupie in that performance. I guess the stress is getting to me too much. It was my first try, and also my last, at my last performance. I remembered that snow was not willing to do it at first, but it being my last performance, I kept insisting and plead her to do it. I was desperate. This performance was also the performance that I did my first standing back tuck with jeans and all on hard concrete, the one I did at Clementi MRT station. Why is it that it always has to be till the last moment before one comes up with things he never thought he would ever do? Is it so that he will not have any regrets? But what about if you failed at your last attempt? Does it signal that the time is not ripe yet, that you still have unfinished business for it to be the last? Well I guess I will not find out until the moment comes. Will I go for it one more "last" time? This story just tells me there is no such thing as the last time, there is always unpredictable number of times, and the road is never ending, unless you decide to end it yourself. It is about how much you wanted it. Hopes and dreams are always out there to be achieved, you never know when you are not going to make it, unless you give up on your on hopes and dreams. The last time may very well also be your first time. Never quit on your passion, for one day your dreams will be realised in one form or another. You just have to believe! I was in total shock when I heard our grp stunt came in 2nd runner up during cheerobics. Our full around stunt failed and hence our tick tock low tick tock high also did not get to do. I would say we absolutely did not train for it. For us, we did not train, we merely join the counts together to form that routine. We ran through that grp stunt routine like only 2-3 times with music and off we went to compete, just for the fun of it. I am not trying to sound boastful or talk big here, but its the truth, and if one were to ask people around us, they will tell you the same thing. This is also one of the reason we were dumbfounded when the result were announced, the main reason still being because we failed stunts. After everything settle in, I thought to myself, how come we won? Then after some thoughts and viewing the routine that we did with "eyes" from few years back, I realised how difficult our routine actually was. Lets just talk about the simplest stunt of all that we did, 2 toss to hand liberty. It has become a everyday stunt for us, something like a shoudler sit, which you know will not fail. 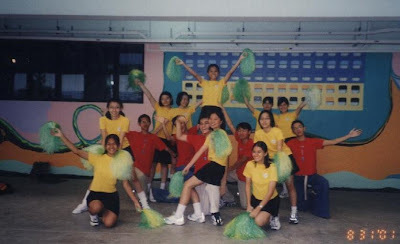 But in actual fact, it is something that most in Singapore cheerleading scene will find it a huge challenge. This is when I realised how come we won, we won simply with the ease of doing toss to hands single lib. For us the grp stunt win was merely a showcase of our basics. It is not the training prior to the competition that really mattered, it is the years of training way before it that mattered. Competition training merely help you boost your confidence and help to take you to another level. On a side note, I know I should not say this, but I do not feel any sense of achievement with this win, we did not work hard for it, nor did our stunts go up nicely. The feeling is a vast difference from winning the open team catagory, where we train our hearts and souls out for it. If given a choice, I rather not have this grp stunts medal, it should go to a more deserving team that trained hard for it. It does not feel good to win by going out there to do "shoulder sits and elevators", if you get what I mean. Afterall winning is not everything, the process matters much more. Again I am very sincere and meant what I said, and I am definelty not trying to be boastful nor a hypocrite here, just doing some self reflection and writing about my thoughts and feelings. I want to truely feel what it is like to be a winner (Grp Stunt), I will take this year and train real hard for next year. Its going to be a different game next year. I will show it! Japan, Taiwan, Thailand... How I wish I can go for all 3 of them in this upcoming "holidays". Not my holidays, but for those still studying. To say I dread my work also cannot, at least it does not eat away all my time. I am just feeling a little restless these days, its like nothing to look forward to. I doubt I can go for all 3 trips coming up, unless I want to burn all my leave and suffer for the rest of the year. It seems like there is time for me now, but at the same time also not enough time. More time than during Cheerobics, but then still not enough pursue alot of things that I wanna do. Sometimes, with the extra spare time, it can also becomes an agony, too much time to rot, but not enough time to focus on what I want. Sometimes I just wish that all my spare time is taken away from me, at least then I do not have to rot so much and feel so useless and alone. Humans are just the greatest contradictors. Always looking for the grass out there. And I think I am the worst of the lot, not only looking for green, but also looking for grass of other colours. What rubbish am I talking about, pardon me for my random rumblings. I just need a direction or a sign. Lets hope watching some videos can lighten up my mood. "I wonder does superman need a compass when he flies..."